Google’s rich answer box is a relatively new feature that provides searchers with direct answers to their questions at the top of the search page. When a searcher types a question into the Google search bar, Google scans through its search results to find the closest answer to the question. 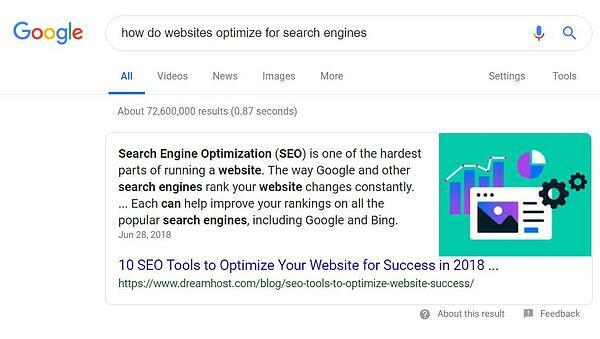 When the search engine finds an answer to the question, it will feature a snippet of the website’s page at the very top of the search results page. In addition to the featured snippet, the rich answer box will provide a direct link to the page from which the answer came. Why is the Rich Answer Box Important? The rich answer box is a valuable opportunity to increase the visibility of your website on Google. If your website can provide the answer to a question that a searcher asks, your site can automatically appear on the top of the first page of search results. Not only can rich answers help increase the visibility of your website on Google, but it can also increase traffic to your website because of the included link to your site. According to Google, rich answers receive 40-50% more clicks than the first search result, which used to be the link receiving the most clicks. Earning a spot in Google’s rich answer box can greatly improve traffic to your website. How Does Google Select Its Rich Answers? The value of appearing in the rich answer box is fairly obvious, but many businesses interested in marketing their website on Google want to know how they can appear in the box. First and foremost, Google tries to understand the meaning behind a user’s search. Then, it scans through search results, attempting to understand the meaning behind the content on websites, rather than simply finding exact word matches. When choosing an answer, Google not only considers the best answer to the question, but it also considers the quality of the website. If two websites have similar answers, Google is likely to pick the site with a better reputation and higher quality content. One of the best ways to appear in the Google’s rich answer box is to answer common industry questions. Make a list of all of the questions that customers of your industry might ask. Then, create content that directly answers as many of these questions as possible. When possible, include the questions as well, such as in an FAQ section, to make it easier for Google to pick up on the answers to these questions. When you answer common industry questions on your website, your site will be more likely to appear in Google’s rich answer box when potential customers search for answers to their questions. When a searcher begins typing a question into the Google search bar, Google provides suggestions that will finish the question. These autofill suggestions are based on commonly searched terms. When deciding which questions to answer on your website, you should consider Google’s autofills, as they will give you a good idea of what people are searching for. The more common questions you answer on your website, the better your chances are of appearing in Google’s rich answer box. Long tail keywords, or key phrases, will be an effective tool in helping your website appear in Google’s rich answer box. Because rich answers focus on searched questions rather than keywords, it’s important to place an emphasis on these longer phrases in order to yield results. Focus on long tail keywords that are question and answer oriented in order to improve your likelihood of appearing in Google’s rich answer box. This tip is important for every aspect of marketing on Google. One of the most important things to Google when ranking search results is the quality of your content. Google has built its reputation on providing quality results for its users, so it emphasizes the quality of the content it lists. Having the answers to users’ questions is an important step in appearing in Google’s rich answer box, but if your content is low-quality, Google will never select your site for this coveted position. For this reason, it’s essential that every piece of content you produce is well-written, error free, spam free, and ideal length. Without this quality assurance, any other efforts to appear in Google’s rich answer box will be unsuccessful.